Posted April 12, 2018 by Amy Kawa & filed under Uncategorized. 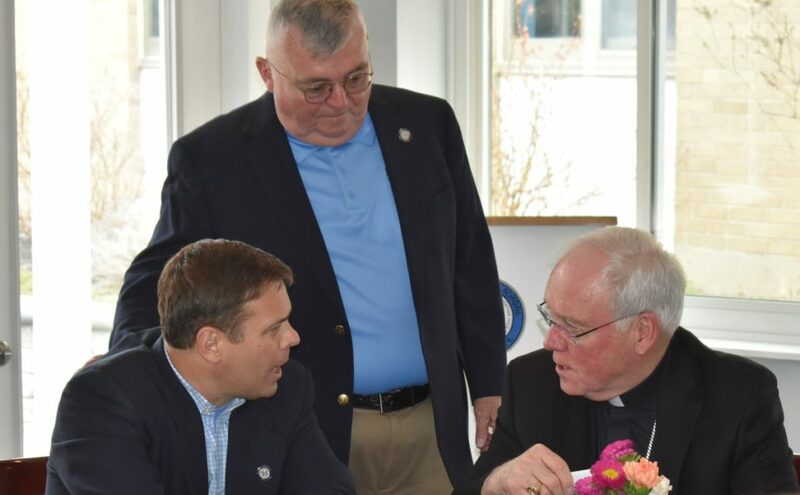 Bishop Richard Malone presided over Mass at St. Mary’s High School on Wednesday, April 11, 2018 in celebration of the school’s Easter liturgy. 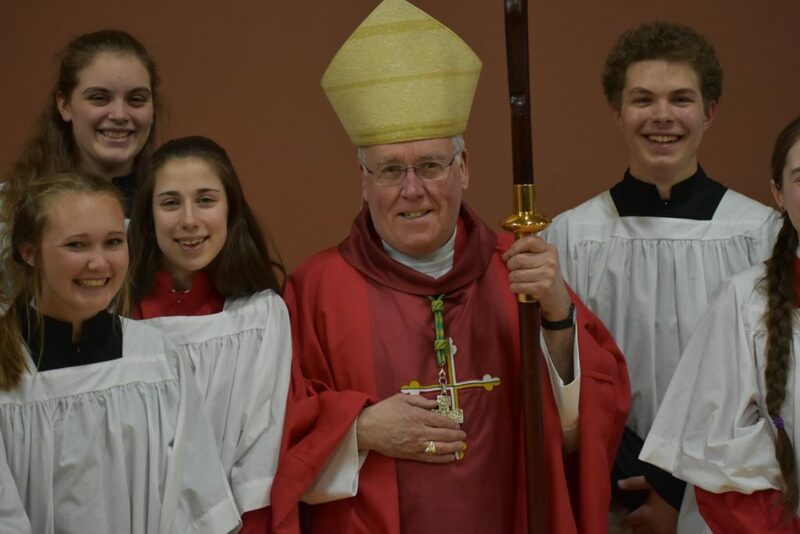 The bishop was joined by four other priests, Father Ryszard, and Deacon Robb Ciezki, St. Mary’s Campus Minister and religion teacher, on the altar. St. Mary’s students, faculty, staff, administration, Board of Trustees, and parents made up the congregation. Two visiting priests, Msgr. David LiPuma ’78 and Fr. Bob Gebhard ’75 are also St. Mary’s alumni. Seminary and St. Mary’s alumnus, Bob Owczarzak ’02 was also able to join us for the Bishop Mass. 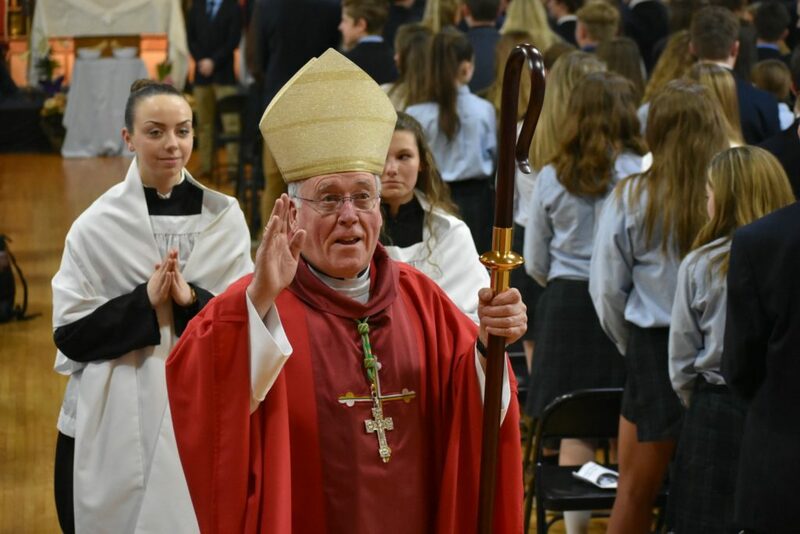 St. Mary’s students were thrilled to have Bishop Malone as their special guest at Mass: “Having the bishop actually at our school, celebrating Easter Mass like this, just adds a different level of excitement to the liturgy and really engages the students in the service,” said Andrew Wargo, a senior and student leader of the school’s Campus Ministry group. Head over to the St. Mary’s High School Facebook page for even more photos! It’s a three-peat! Congratulations are in order for the USA Paralympic Sled Hockey Team, who brought home gold for the third straight Paralympics. St. Mary’s Class of 2010 alumnus, Adam Page, has been a member of the team in each of the past three gold medal-winning Paralympics. This year, Team USA defeated Canada in overtime to bring home the gold. In 2010, Adam was a senior at St. Mary’s and participated in his first Paralympics while attending school. He brought home his first gold medal to St. Mary’s, which was an amazing experience for our students. Adam plans to be involved with the Niagara Cup-champion St. Mary’s men’s hockey team upon his return, so it should be a wonderful Lancer homecoming once again! Posted March 28, 2018 by Amy Kawa & filed under Uncategorized. 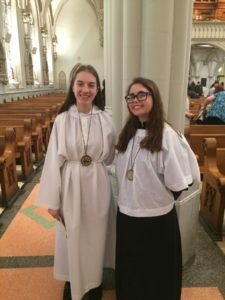 Three St. Mary’s students were presented with Altar Server of the Year honors for their work at the various parishes they serve throughout the area. Freshman Victoria Loniewski (left) serves at St. Mother Theresa of Calcutta Parish and junior Athena Mohamed (right) are pictured receiving their award, and sophomore Joe Kupczyk (not pictured) was also honored. St. Mary’s participated in the Lancaster Youth Bureau’s annual trivia night. 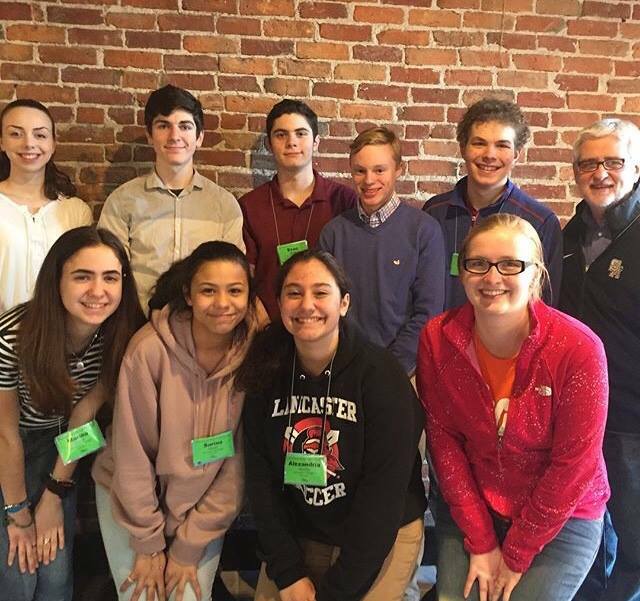 Two St. Mary’s student teams competed against other youth groups from the Lancaster-Depew area. St. Mary’s National Honor Society Team took first place! 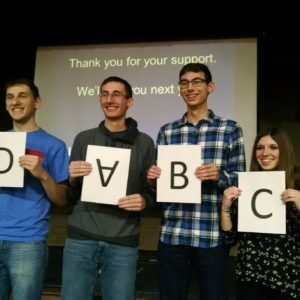 Congrats to the winners (all wise seniors): Jake Was, Ryan Tytka, Zack Laistner, and Chelsea Okon. You did St. Mary’s proud! St. Mary’s celebrated Pi Day on March 14th (3.14) by bringing in pies for a cause. All store-bought pies brought in were donated to Lancaster food pantries. In total, over 500 pies were donated in just one morning. What an accomplishment! 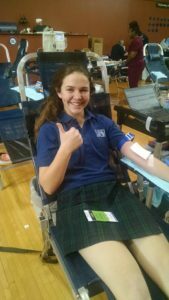 St. Mary’s hosted a Unyts – Donate Life blood drive. 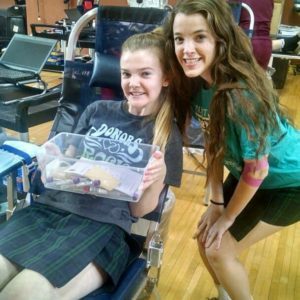 When all was said and done, 55 students and faculty members donated blood, meaning 165 lives were saved today at SMH!! We couldn’t be prouder! Thank you to Unyts for doing such a wonderful job, as always! Take a look at some of our students mixed in with other conventioneers! Posted March 2, 2018 by Amy Kawa & filed under Uncategorized. Spirit Week is a time for the classes of St. Mary’s High School to come together and compete, with hopes to beat the almighty Seniors. In my opinion, this year’s Spirit Week was definitely the most successful, especially considering the grand prize was, once again, a day off from school. To start off the week, each class came together to play bingo in the Gus. The first bingo winner happened to be Junior Jacob Wilk, who then earned his class some points. Surprising virtually everyone, the Juniors started off strong this year, as Ashley Cruz soon followed with another bingo win. Monday also offered amazing costumes. Although many people simply glued a black circle on their shirts and claimed they were a domino, some went above and beyond for their costumes. A group of Juniors created their own Hungry Hippos costumes, and Sophomores Sam Mickel, Kerry Sullivan, Rebecca O’Conner, Mary Owczarczak, Jillian Szeluga, and Madison Nuttle all dressed up as the characters from Clue. 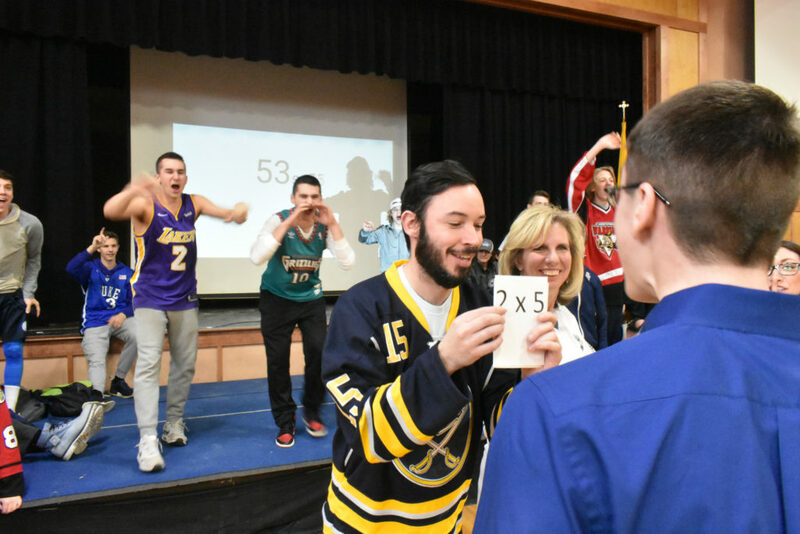 As Tuesday rolled around, the dress was “Mathlete vs. Athlete,” and students certainly didn’t disappoint. The majority of St. Mary’s students wore athletic attire, while a small percentage dressed as nerds. Every Senior and Junior dressed up, earning them both a substantial amount of points. While the outfits were memorable, it was the games that made “Mathlete vs Athlete Day” a success. It started off with each class participating in a timed, extravagant relay. The Juniors made it to the end, but couldn’t handle the “Mathlete” multiplication tables. The Sophomores and Freshmen put up valiant efforts, but the Seniors took the win. After some other games, the overall class scores were close, with the Juniors and Seniors leading the way. On Wednesday, the dress was class colors: Seniors wore blue, Juniors wore green, Sophomores wore yellow, and the Freshmen wore red. There were no scheduled events, but Mr. Junik decided that every period he would email all the students a challenge that would allow each class the chance to receive extra points. The week ended with a pride day dress, and everyone was getting nervous for the talent show performances. As always, it was Freshmen first. Despite being the youngest class, they undoubtedly displayed confidence and enthusiasm, with a stellar performance. The Sophomores performed next and brought something original to the table, which got the other classes pumped for what was in store. There was a hilariously “dramatic” video, featuring a few Sophomore boys regarding their “redemption,” since they were struggling to maintain third place after winning Homecoming Week a few months prior. One of the more memorable “talents” involved Zach Charvat eating thirty-five chicken nuggets in under two minutes. The Junior class took a more unique approach to the talent show. Donald Trump, played by Alex Denz, read poetry written by Brianna Propis to introduce each portion of the show that incorporated the Spirit Week theme. Hannah Mulhern ran around in her t-rex costume holding posters with board games drawn on them by Josh Weiss that corresponded with the talents displayed. Lastly, the Seniors brought energy, comedy, singing, and dancing to the table. They put their own spin on the well-known High School Musical story, and ended with a giant “We’re All in this Together” flash mob. The results were in from the judges: Juniors get first place for the talent show! So, who would be the overall winners? The Seniors ultimately won Spirit Week and the day off with 230 points (while the Juniors came in second with 228 points). Posted February 20, 2018 by Amy Kawa & filed under Uncategorized. In a recent edition of Buffalo Business First, enrollment numbers were released for the private high schools in Western New York. 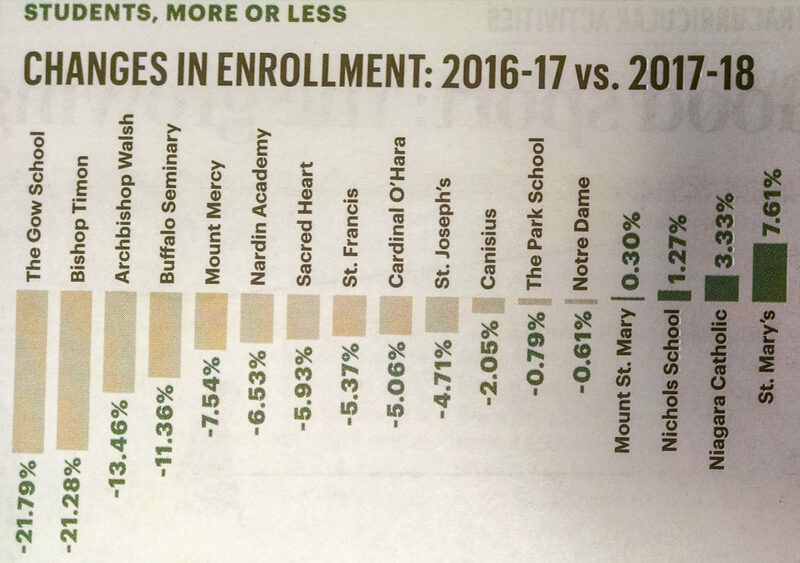 A somewhat disconcerting trend is developing among many area schools, like Canisius, St. Joe’s, and Sacred Heart, in that enrollment is on the downward trend over the past five years or so. St. Mary’s, however, is bucking this trend and has become the fastest-growing private high school in Western New York. SMH shows no signs of slowing down either. This year’s Freshmen Registration was the most successful one in years, and the size of the incoming Class of 2022 will surpass the size of the graduating Class of 2018, resulting in another year of positive enrollment growth in Lancerville. The future is bright at St. Mary’s High School! Posted February 12, 2018 by Amy Kawa & filed under Uncategorized. In October, St. Mary’s High School took part in the “School Pride” Food Drive, sponsored by the Village of Depew and Tops in Education Program. 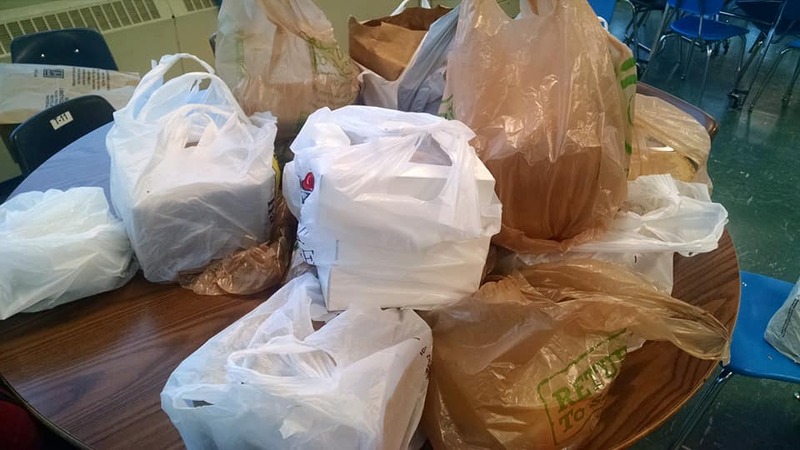 The food drive brought together St. Mary’s, Lancaster High School, and Depew High School for a friendly, service-based competition to see who could bring in the most non-perishable foods to benefit three local pantries. 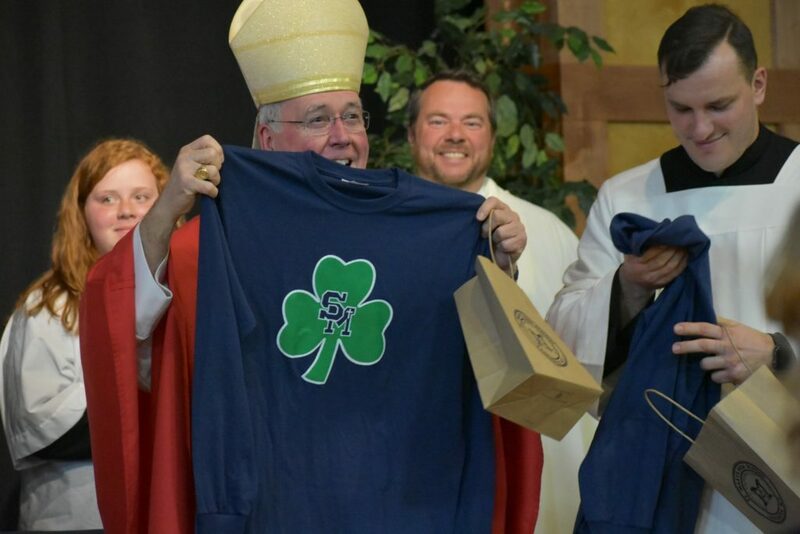 On Saturday evening, St. Mary’s received its prize for winning the food drive. 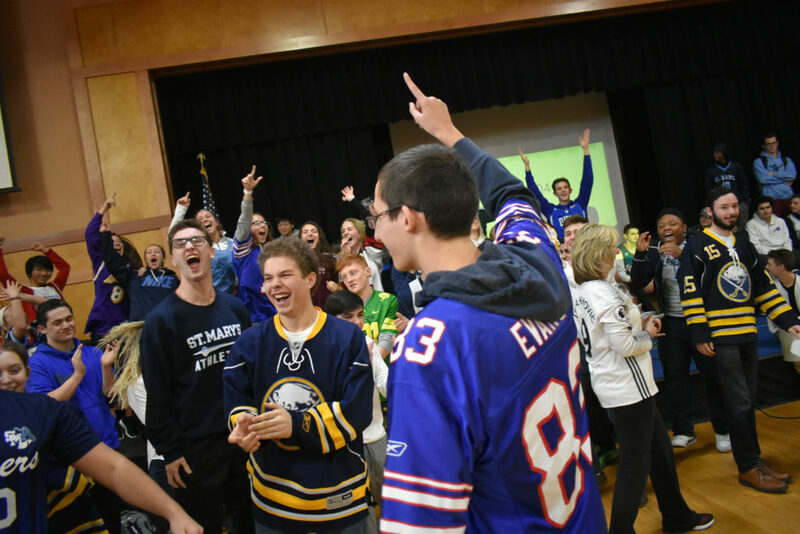 The school hosted a dance for students, sponsored by the Village of Depew, with the music provided by Ultimate Events and a pizza party, with pizza donated by Lynn’s Wings & Things of South Buffalo. The Depew Village Mayor, Jesse Nikonowicz, and Depew Village Trustee member, Audrey Hamernik, also made an appearance to wish the food drive winners well. 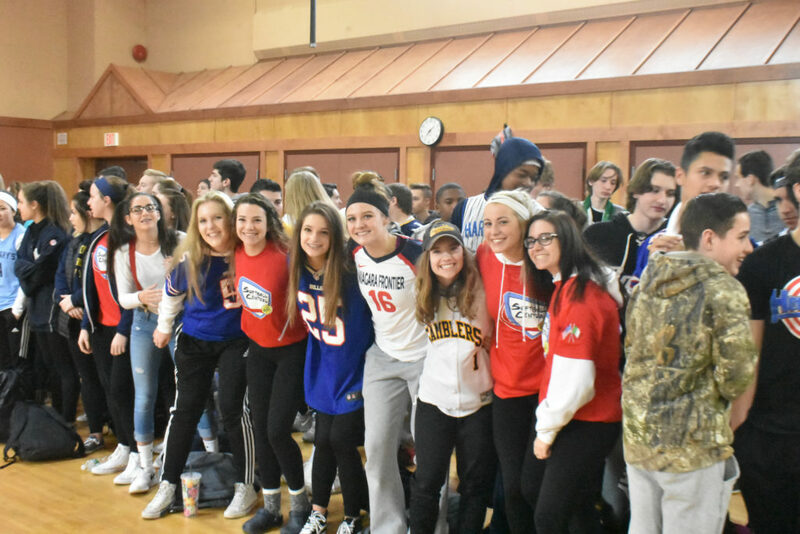 St. Mary’s raised over $700 at the dance and plans to hold another fundraiser later this month to help bolster the total donation to Make-A-Wish. 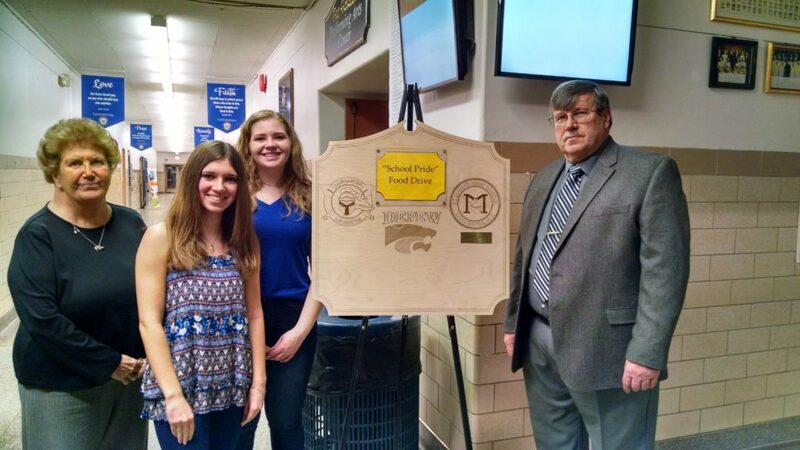 Picture Caption: (From left to right) Depew Village Trustee member Audrey Hamernik, St. Mary’s National Honor Society President Chelsea Okon ʼ18, National Honor Society member Stephanie Baran ʼ18, and Depew Village Mayor Jesse Nikonowicz pose with the plaque gifted to St. Mary’s for winning the “School Pride” Food Drive outside of the St. Mary’s school dance this past weekend.